So goes the opening poem in this book by Frederick Warne. It is also the opening poem for the original Flower Fairies book by Cicely Mary Barker, copyright 1923, a treasure from my Grandma Dorothy. Warne reproduced Barker’s illustrations on luscious, rich pages and turned his book (copyright 2008) into the consummate fairy book. It answers every question a girl could ask about fairies. What they eat, what they wear, where they live, how their laughter sounds like the tinkling of bells in the air. It offers ideas for fairy crafts, has a collection of fairy stories to read, and will even help you figure out your own fairy name. Eliza has been enamored with fairies for awhile. Tell her they don’t exist and she won’t believe you. She’ll earnestly tell you three little pixies visit our home regularly. Luna, Friedah, and Gelsey. She’s never seen them, of course. It’s almost impossible to see a fairy; they’re quick as lightning, and wary of humans. But she knows when they come to visit. A chair in her fairy house has been tipped over, a tiny dress has gone missing, or she’ll notice the finest of fairy dust sprinkled on a table. And occasionally… the fairies leave her a note. Childhood is a wisp of a season, such a brief bit of time when imaginations ignite without effort. My grandmother believed in fairies. She taught us how to make fairy tables, told us maple keys twirling to the ground would become fairy wings, read us stories of sprites, brownies, and trolls. I want to encourage my children to dream, to see things that don’t exist right in front of them. Wild dreamers move us forward, to us to the edge of the world, then beyond. So we glittered invitations and left them on doorsteps. We set tables, tied balloons to chairs, filled terracotta pots and tucked impatiens, alyssum and lobelia into soft soil that would soon become fairy gardens for girls to take home. We flew butterflies from the maple tree and hung paper lanterns. We set up fairy dwellings throughout the yard. Bridges, chairs, trellises, and even an acorn mailbox where girls could leave the fairies a letter. Eliza carefully placed these miniature whicker chairs at the end of a stone path for the fairy king and queen. Look closely and you will see fairy dust. And a few minutes before the party began, reinforcements arrived. (Cue the Hallelujah chorus.) I wouldn’t have survived the evening without my sister Sarah and Doug’s mother, Renae. Thank you ladies! A second wave of reinforcements came a few minutes later. Lizzie, Hannah, and Amanda – beautiful young women from our ward (church congregation) who offered their time without pay as part of their Personal Progress program. They were amazing. Perfect role models for Eliza and her friends. As the guests arrived, Hannah and Amanda immediately gathered them, formed a circle, and began to play name games. A brilliant idea – something they did all on their own. We set a small table with teacups and saucers so the girls could snack on crumpets, gum drops, and other fairy bites. Then I pulled the girls close and we opened Warne’s book. I read to them about flower fairies – asked them if they’d ever seen a fairy, told them that on magical evenings, a quiet, observant girl can hear the whisperings of fairies, see signs of them… everywhere. With the permission of our neighbors, the girls went on a fairy hike though the adjoining backyards. They were hunting for fairy treasures – items we would use to make their fairy gardens. First clue? They hiked quietly. No screaming or racing. An unusually mild atmosphere for a party of seventeen girls. Hurrying loudly would scare the fairies away, so they moved gently – watched with big eyes, spoke in excited whispers. Once the girls brought back their bundles of treasures, we began the fairy gardens. I pre-planted the pots so the girls could spend their time decorating. 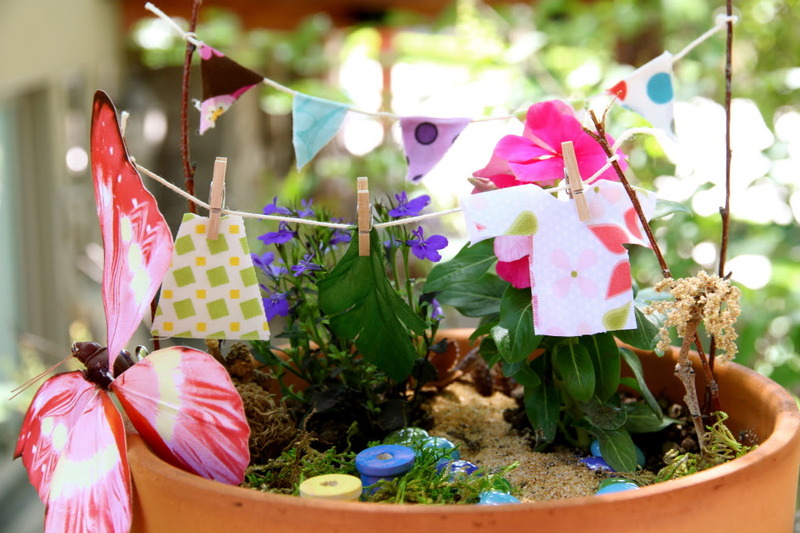 They made a sand path, lined it with shiny stones or buttons, painted wooden spools for fairy stools, tied twine between two twigs for a clothesline, cut scraps of material for fairy clothes or a flag banner and hung them with tiny wooden clothespins. Some painted their names on the front of their pot. Each girls’ garden was different, her own. When we finished the gardens, Eliza blew out her candles. We ate cupcakes and she opened presents. The girls were absolutely delightful. They got along famously, were polite and kind to each other. I believe their goodness added to the magic of the evening. Now the confession. This party nearly did me in. By the end of the night, every bone in my body ached. I had been on my feet all day long. What I first envisioned as a rather simple evening, turned out to be much more complicated than I thought. It required more money and preparation than I anticipated, and as I was racing to finish things up, I wondered, is this really worth it? I could have done less, spent less. But as I paused while picking up cupcake wrappers to take a picture with Eliza, I asked her if she’d had a good time. Her response? An exuberant neck squeeze. Funny how that one hug made it all worth it. Another whimsical read we’ve been enjoying (even the boys), is this classic illustrated by Garth Williams. My kids listen with rapt attention when I crack the pages. Thank you Gaylyn. And one more thing to report. We finally finished our fairy dolls. Dressed them all proper with wings and fairy hats. This craft required pipe cleaners, wooden beads for the head (just bend the pipe cleaner in half, slip the folded end through the bead so it has a loop, run embroidery thread through the loop for hair, then pull it down tight), silk flowers for dresses and collars, and additional pipe cleaners for legs/arms. We braided their hair, twisted buns, left some locks hanging down. But my favorite hairstyle was this darling pixie-cut Eliza decided to try. And I adore the acorn hats. Aren’t they fun? Today, while cleaning up from lunch, I looked outside to see all my kids hunting low through the grass, then pausing to look up into the sky. Magnifying glasses poked out of their bags, pads of paper and pencils were in their hands. They were “spying” they said, “on the clouds, the trees, the bushes, and the squirrels.” Looking for fairies. Or anything else that might catch their fancy. So where are the fairies? Is it a secret? Oh man, Cath! This party sounds amazing, I am blown away by your creativity! Seventeen girls!!! You are wonder-woman, but more importantly, an incredible mom! What fun memories for you and your kids. Deb – we still wish Lizzie could have made it! Thanks for all your help and contributions to the party. I love you. As always I really love your creativity — and your bravery to invite that many kids and make it a wonderful party. And I will certainly remember some of your ideas for Annika's next party — a fairy party sounds like a wonderful idea just for the thought that the girls will have to be quiet in order not to scare the fairies away, *lol*. Love it! A few months ago, Annika (5) told us that for a job later in life she wanted to become either a fairy or a princess. So Marie (14) told her that fairy jobs weren't all that easy to get these days, because there weren't that many of them. And I added that even jobs as princesses were kind of scarce — the draw back of democracy… So Annika shrugged her shoulders and said: "Okay, in that case I'll become a police officer." Totally love it. Amazing how a great big, heartfelt hug from those you love most makes everything worth it in the end. We are heading into birthday season here, the 3 big kids all have birthdays in the next 6 weeks. Let the fun begin! I think you make childhood magical for your children! Shells – phew! you have a busy birthday season at your house! enjoy, enjoy! Lynley – saw your car down the street today. All I can say is hooray!!! Let's get you moved in! Candice – you are sweet. Love the pics of your beautiful children. Your daughter is so very lucky.